One list I’ve always wanted to put together was my all-time favorite Redskins. Each month I will list a new player until the end of the year when I name my favorite Washington Redskins player of all time. Coming up with twelve names isn’t really that easy when you start to break it down, so I did the best I could and had very few rules for the list. The first one being that they had to be playing when I became a fan in 1982. There are many legendary players like Sammy Baugh, Sonny Jurgensen, Chris Hanburger, Charley Taylor, Bobby Mitchell and so on. All of these guys are legendary Redskins and I love the history they bring to the organization, but I never saw them play…so I can’t really sort them out for this list. The other rule was that they have to been a part of the Redskins at least three years…so for now that means no RGIII or Alfred Morris. That’s it, two simple rules…I like to keep things as simple as possible. 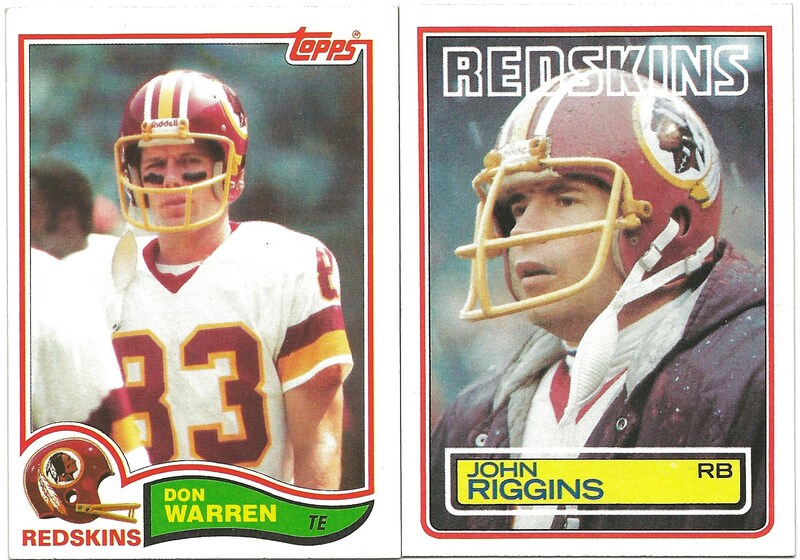 So, for January, my #12 All-Time favorite Washington Redskin is…are The Hogs. First name on the list and I’m bending my rules…guess I’m a little scatter brained sometimes. I’m sticking with The Hogs on this one though. They are the main reason for the name of the blog and a major reason why I became a fan of the Redskins in the first place. As a kid, I loved the name…but couldn’t really figure out why they were called The Hogs if they played for a team with a (racist) Native American moniker as their mascot…until I understood that it was due to their nastiness and scrappiness on the offensive line. Ah yes, Pigs…Hogs…mud…getting dirty, I get it now. This makes total sense. This group of men was led by Joe Bugel and played as a unit from 1982 to 1984 as the first iteration of The Hogs. As players retired and other guys came in, they remained The Hogs but the core of guys I remember were a part of the back to back NFC Championship teams in 1982 and 1983. Working on my team sets, I’ve come to realize that most card companies don’t have offensive lineman cards since they don’t typically collect stats and they are mostly unnamed guys. I guess if you hear the name of an O-Line guy than he’s probably not doing a very good job…right? They seem to appreciate that as well and love the lack of attention and working as one unit rather than being pieces on a team. The great thing about the O-Linemen is that they seem to develop a bond tighter than any other team on the field since they have to work in unison each and every play and be aware of what is being run behind them. They set up the skills guys to have their spotlight and rarely get a light for them to stand under…but that comes with the territory I guess. Sadly Russ Grimm is the only Hog to be inducted in to the Pro Football Hall of Fame in 2010. Joe Jacoby has been on the list many years, but just can get enough votes to get in…which is sad. If the Redskins had won Super Bowl XVIII against the Raiders I believe Jacoby would be in and possibly Bostic and May…unfortunately that just didn’t happen. All Redskin fans know these guys and appreciate what they brought to the team and the glory days of Joes Gibbs I, RFK and Jack Kent Cooke. Hopefully a new Hog chapter will develop with Trent Williams, Josh LeRibeus, Adam Gettis, and Erik Cooke. Although The Hogs carried on until the early 1990’s, they were the core and the #12 favorite Redskins for me. –HTTR!